Margin Trading refers to the practice of using borrowed funds from a broker to trade a digital asset, which forms the collateral for the loan from the broker. Such use of leverage can magnify gains. 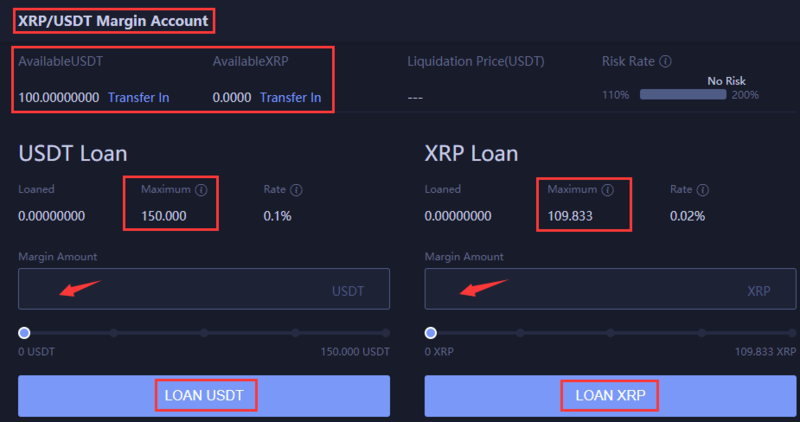 From this, we can see that the first step of Margin Trading is to loan funds. With loans, you can trade. You can choose to long or short a certain coin. Finally, you need to repay the interest. This tutorial consists of three parts: loan, trade and repay. Section 1: How can I loan funds? 1. 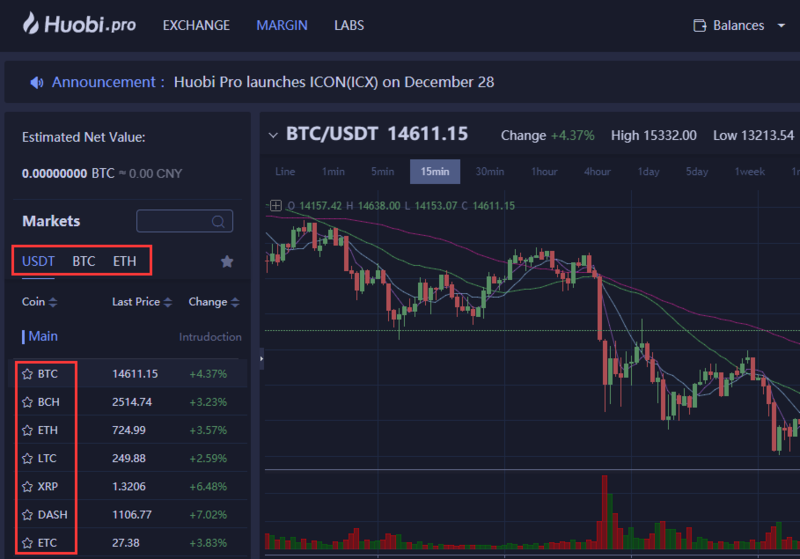 Log into www.huobi.pro or www.huobipro.com and click on the “Margin” button. You will enter the “Margin Trading” Page. 2. You will see all the available trading pairs for Margin Trading on the left. You can choose to trade any of them as you need. Reminder: Each trading pair has an independent Margin Account with independent funds. The funds can not be transferred between Margin Accounts. This means that when you use many leverages if one Margin Account is forced to Liquidation or Margin Call, other Accounts will not automatically transfer funds to this Account. Users need to transfer funds to their Accounts by themselves. 5. Once you successfully transfer Margin to your Margin Account, click on the “Margin Management” button on the right and start Margin Trading. 6. 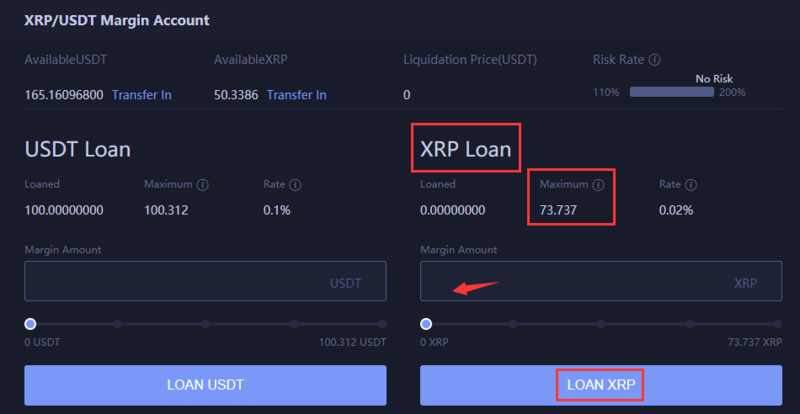 In the “Margin Trading” page, the available amount is based on your Margin amount and leverage time; you can loan as you need. When there are insufficient funds, please decrease the loan amount. When there are sufficient funds, loans can arrive at your account in real time. 7. When the loan is completed, you can view the details such as Loan Date and Rate, etc. in the Loan Position. Risk Reminder: Each coin has a minimum and maximum loan amount. When the Margin amount does not reach the minimum, the “Maximum” will appear to be 0. 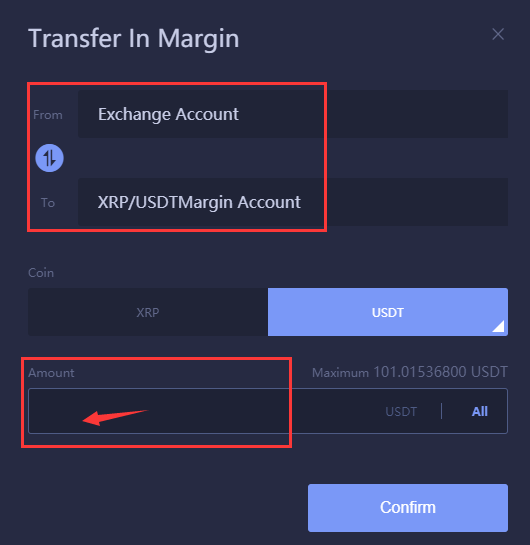 In this way, you should transfer enough Margin into Margin Account. “Loaned” refers to the amount that you have successfully loaned from our platform. “Maximum” refers to the amount that you can loan. The maximum limit of loan is subject to what is shown on your page. Section 2: How Can I Earn Profits By Margin Trading When The Coin Price Rises (How Can I Long A Certain Coin)? 2. 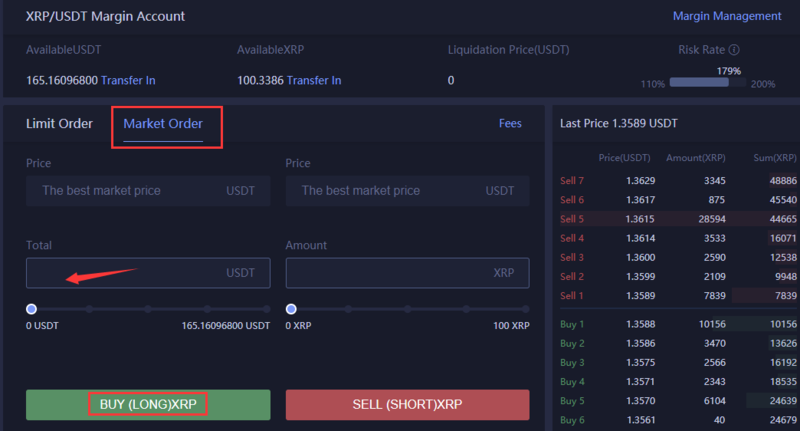 When the price of the coin goes up to your expected price, choose “Limit Order” or “Market Order” to sell. By placing “Limit Order,” you can set the selling price and amount. When the price reaches what you set, your coin will be sold. 3. If your Limit Order is successfully placed, before it is executed, you can cancel it whenever you want. Click on “Cancel” to the right of your order detail in the “Open Orders” Page. (1) Choose “Market Order,” and your sell price is the optimal market price. Normally, it will be executed in real time. (2) Buy at low price and sell at high price. Repay the loan and interest. Once your Margin and interest are paid, you are left with your profits. (3) The principle of Long is to “Buy at a low price and sell at a high price,” then earn the profits. To avoid loss, you should pay attention to the real-time market when you buy or sell. Keep your loss and profit in a reasonable range, and prevent liquidation or debt. Section 3: How Can I Earn Profits By Margin Trading When The Coin Price Drops (How Can I Short A Certain Coin)? 1. 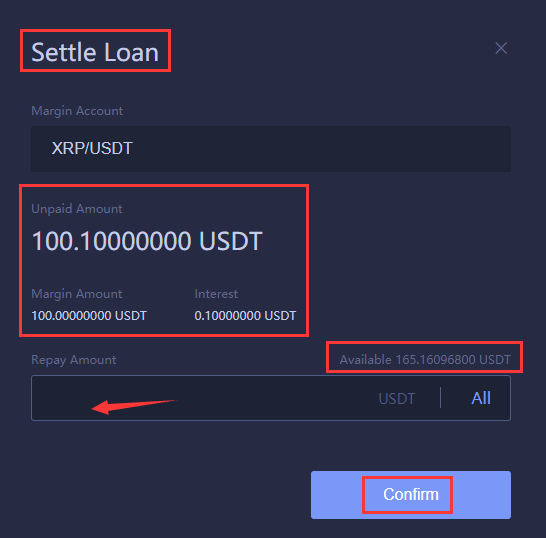 First, loan a certain amount of XRP in the “Margin” Page. Sell your loaned coin at a high price and buy it at a low price to repay the loan and interest. The bigger the price spread is, the more profits you can earn by shorting the coin. Leverage enables users to gain higher profits through fewer funds. If you estimate the price trend correctly and you will be able to earn money by shorting or longing a coin. But if you estimate it incorrectly, you will face a larger loss. Ordinary investors should avoid high leverage trading to prevent liquidation or debt. Section 4: How Can I Repay The Loan And Interest? 1. When you need to repay the loan and interest, click on “Margin Management” button and view the repay list on the page. 2. Click on the “Repay” button on the right and go to the Repay Page. Enter the repay amount and click on “Confirm.” If there is not enough amount for repayment, please transfer funds into Margin Account. 1. 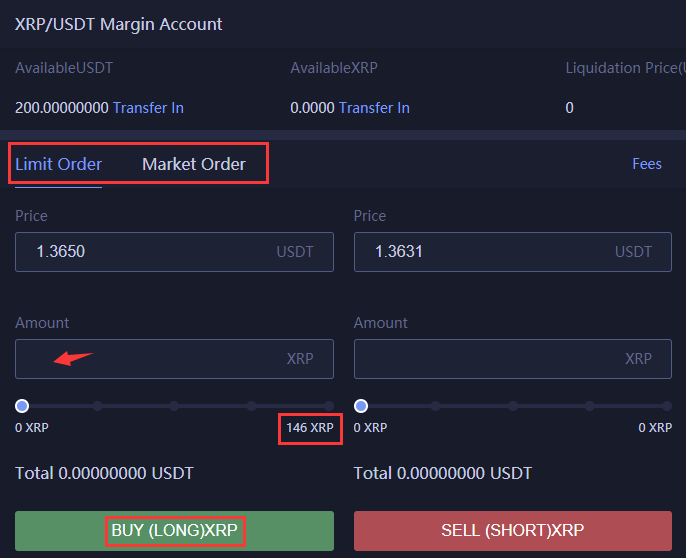 What is Margin Trading? Margin Trading refers to the practice of using borrowed funds from our platform to trade a digital asset, which forms the collateral for the loan. For example, if you have 100 USDT, you can loan from our platform to trade, and your gains can be magnified. 2. How can I apply for loans? You need to transfer funds to your Margin Account. Once funds are transferred, click on “Margin Management” in your Margin Account and apply for loans. Take XRP/USDT pair as an example. You can loan more USDT (you can also loan BTC and ETH when they are open). 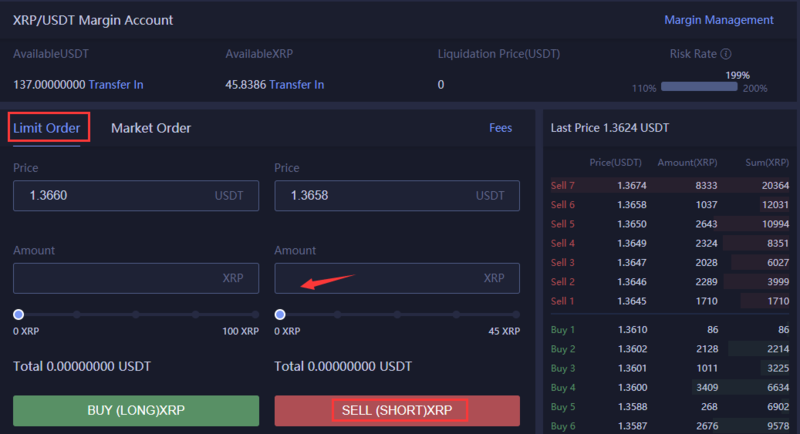 Buy XRP at a low price and sell at high price to gain profits from price spread. Then repay the USDT to our platform. Take XRP as an example. You can loan more XRP. 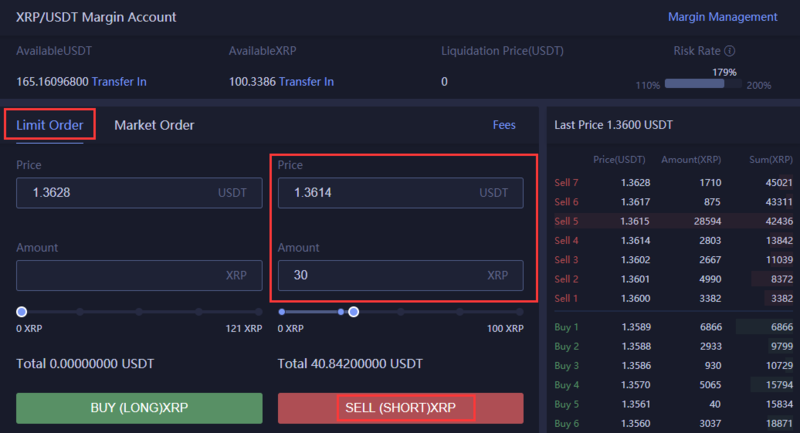 Sell XRP at a high price and buy at a low price to gain profits from the price spread. Then repay the XRP to our platform. 5. Under what circumstances will my Account be forced into Liquidation? When you are trading a certain pair, and the risk rate is less than or equal to 110%, your orders will be forced to execute to repay the loan. 6. How will the system set the Liquidation Price? The system will set the Liquidation Price whose risk rate is less than or equal to 110% . This price should be the best for you. 7. How is Risk Rate calculated? 8. Why can’t I transfer funds from Margin Account when I have funds? Withdrawable Balance = Wallet Balance – 2 * Loaned Amount. You can refer to details on the page. 9. How much Interest should I pay for Margin Trading? Interest is charged according to the percentage of the loan amount. One day/24 hour is considered as a unit. Any time less than 24 hours will be considered as one day. You can refer to details of Interest Rate on the page. 10. How much is the leverage time? Each trading pair has different leverage times. You can refer to details on the page. 11. How can I check the risk rate on my Account? Risk rate is shown in the trading section, which is in the bottom of “Margin Account’ page. 12. How can I check my loan history? Please check in Loan History, which is in the bottom of “Margin Account’ page. 13. How can I repay the loan? Please repay in Loan Position, which is in the bottom of “Margin Account’ page.